What is Really Killing People in Gulf? 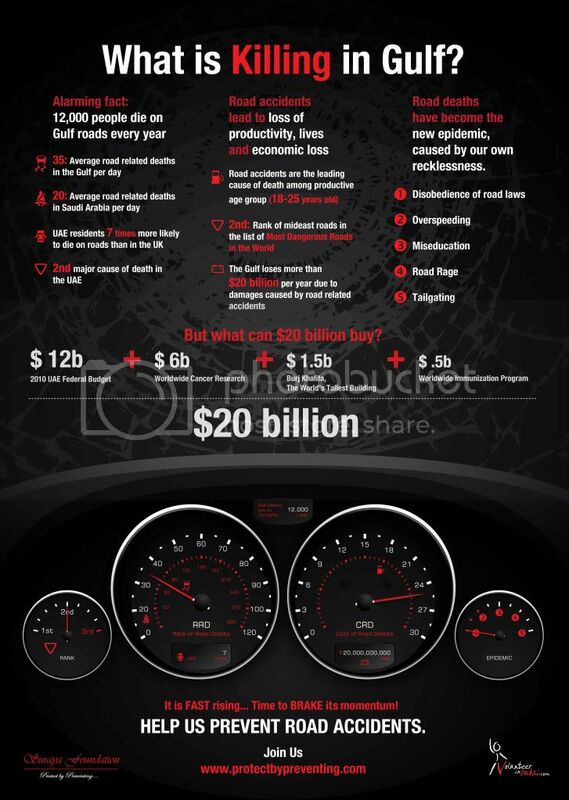 This is an information graphic highlighting the amount of people killed by road accidents in the Arabian Gulf (Bahrain, Qatar, Kuwait, Oman, UAE & Saudi Arabia) and its effect on their economy. Did you know that an estimated 12,000 lives are lost each year on our roads? Our recklessness ― disobedience of road laws, overspeeding, mis education, road rage and tailgating is the major reason for this. In addition, this preventable epidemic results in the Gulf countries losing up to $20 billion in economic revenue. Please help us in educating others by sharing this information in hopes that it will bring awareness to how much road deaths are affecting us. This graphic was created thanks to the great work of our enthusiastic volunteers who spent 40 hours researching information, collecting statistics, collating data, simplifying all the research & putting it all together into this creative infograph. 'What is Killing in Gulf' by Suraya Foundation is licensed under a Creative Commons Attribution-NonCommercial-NoDerivs 3.0 Unported License. Permissions beyond the scope of this license may be available at Suraya Foundation.